This is the second article in the series of articles on Exception Handling in Sql Server. Below is the list of other articles in this series. 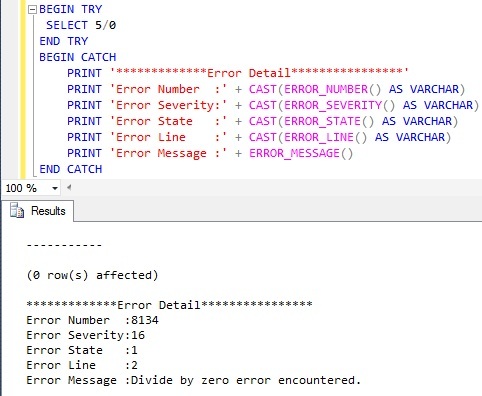 TRY…CATCH is the Structured Error handling construct introduced in Sql Server 2005. It is similar to the one which we have in C#, but it doesn’t have the FINALLY block. 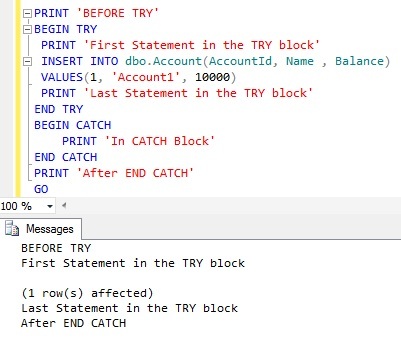 If any error is raised by the statement in the TRY block then the control is immediately passed to the CATCH block. If none of the statement in the TRY block raises any exception then the CATCH block will not be executed. Let us understand TRY…CATCH construct with below extensive list of examples. 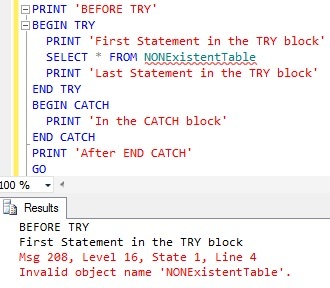 Let us execute the below script and observe what will be the behavior of TRY..CATCH construct if none of the Statements in the TRY block raises any exception. From the above result it is clear that, if the statements enclosed within TRY block doesn’t result in any errors then the control is not passed to the CATCH block instead the execution continues with immediate statement after the END CATCH statement. Let us empty the Account Table before proceeding with the next DEMO. Let us execute the below script and observe what will be the behavior of TRY..CATCH construct. Here the Second INSERT statement results in a statement Terminating Primary Key Violation error. 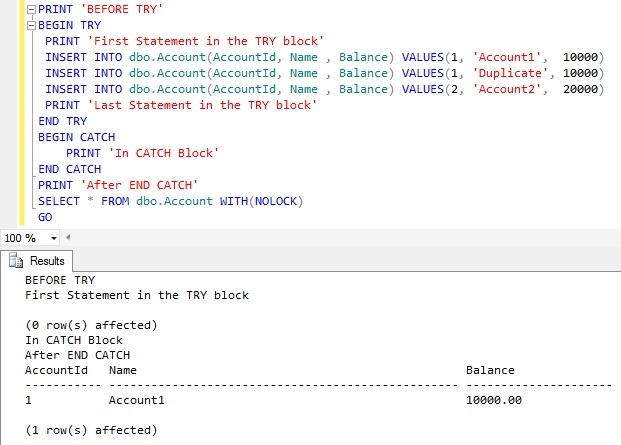 From the above result it is clear that as soon as the error is encountered in the TRY block, sql server terminates the Statement which raised the error, no subsequent statements in the TRY block are executed and the control is passed to the CATCH block. Let us execute the below script and observe what will be the behavior of TRY..CATCH construct. Here the Second statement (i.e. UPDATE statement) results in a Batch Abortion CONVERSION/CAST error. 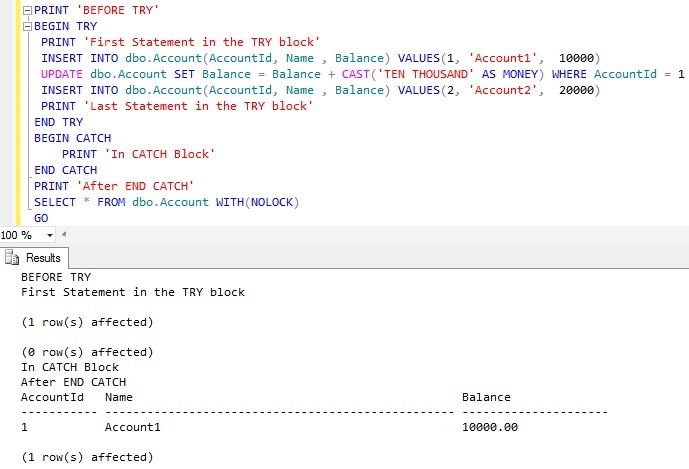 In this DEMO we will see how we can use the Transactions with TRY..CATCH constructs. 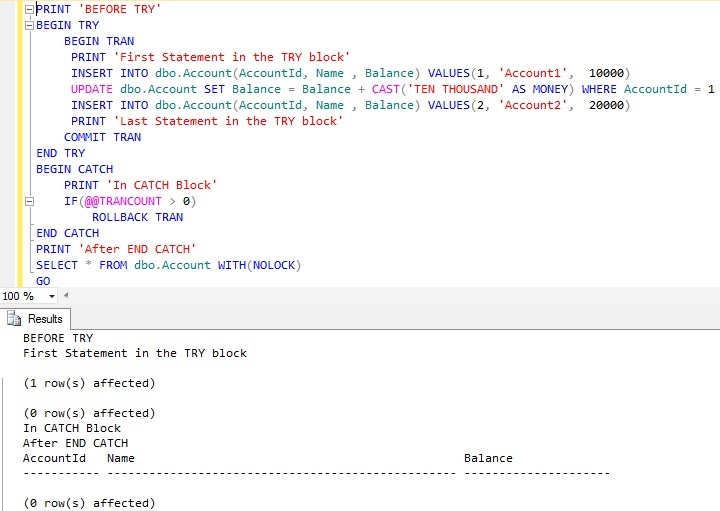 Here @@TRANCOUNT in the CATCH block identifies whether we have any active transactions, if yes we are rolling back the transaction. Because of this we don’t see any records in the Account Table. Below is the list of ERROR FUNCTIONS which we can use in the CATCH block to get the details of the Error which resulted in transferring the control from the TRY block to the CATCH block. ERROR_NUMBER() : Returns the Error Number. ERROR_SEVERITY() : Returns the Severity of the Error. ERROR_STATE() : Returns the State of the Error. ERROR_PROCEDURE(): Returns the name of the SP/UDF in which the error occurred. ERROR_LINE() : Returns the line number of the Sql statement which raised the error. ERROR_MESSAGE() : Returns the error message. Will cover few more examples of TRY…CATCH construct while discussing on the RAISERROR and THROW Statement.